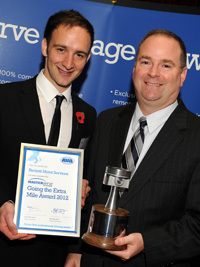 Photo: Timothy Guidotti of Ferdotti Motor Services Ltd receives the award from Mark Bryan, Managing Director ARI Fleet UK. For the second year running Ferdotti Motor Services Ltd have won the top customer service award from ARI Fleet UK (formerly Fleet Support Group). The top prize was awarded for gaining the most compliments from customers and the ARI operations team as a percentage against a workload. ARI Fleet UK, formerly Fleet Support Group (FSG), looks after approximately 55,000 vehicles and offers a comprehensive fleet product and services portfolio. Chippenham-based FSG was founded in 1987 and became a well-established multi award-winning organisation. The company was acquired by ARI in December 2011. For further information, please feel free to visit ARI Fleet.